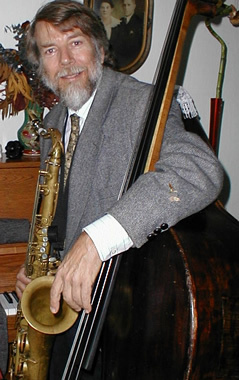 Multi-instrumentalist Steve Schuster seamlessly switches between tenor, alto & soprano saxes, flute, piccolo, clarinet & bass clarinet, as well as upright bass. He has played and recorded with some of the biggest names in Bay Area music, including the Grateful Dead, the Jefferson Starship, Sly and the Family Stone, the Quicksilver Messenger Service, as well as the Jerry Garcia Band, Mickey Hart, Robert Hunter, Grace Slick, George Clinton and Parliament, the Funkadelics, Bobby Wommack, James and Bobby Purify, Bobbi Humpheries and Ron Carter. Classically trained, Steve has also performed with The Lincoln Center Chamber Orchestra, San Francisco Chamber Orchestra, Boulder Symphony, Eugene Ballet Orchestra and members of the London (England) Symphony Orchestra. He is also a prolific composer and arranger. His songs have been recorded by the Jefferson Starship and the Quicksilver Messenger Service, and he has scored commercial films and produced film/video music for many industrial clients, including Hewlett Packard and Apple Computer.